037. CAPTAIN ROBERT FALCON SCOTT. Issued by Brooke Bond Oxo Ltd. (1973). 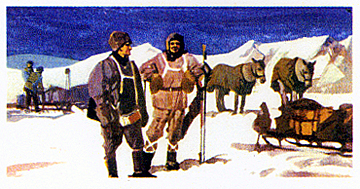 Card number 35 from a set of 50 entitled "Adventurers & Explorers". Size: Ca. 1.43" x 2.7". Recto: View of 4 men and sledges and ponies on the ice.